Boitani's presentation of the classics is as entertaining and unexpected as it is informative. He invites the reader to discover the timeless beauty and wisdom of ancient literature, highlighting its profound and surprising connections to the present. With their emphasis on the mutability and fluidity of identity and matter, their examination of the power and position of women in society, and their enduring treatments of force and subjugation, fate and free will, the ethical life, hospitality, love, compassion, and mysticism, the classics play active roles in our lives and can help us refine our opinions and our values. 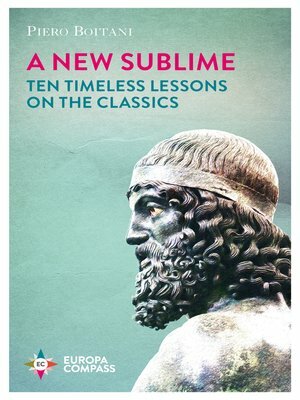 Ranging from Homer to Tacitus, with Thucydides, Aristotle Sophocles, Cicero, and many others in between, Boitani's A New Sublime is a fresh, inspiring reminder of the enduring importance and beauty of the classics of the Western canon. Pietro Boitani is one of Italy's most renowned philologists and literary critics. An expert on ancient myths, medievalist, and Dante scholar, he is currently Professor of Comparative Literature at the "Sapienza" University in Rome.